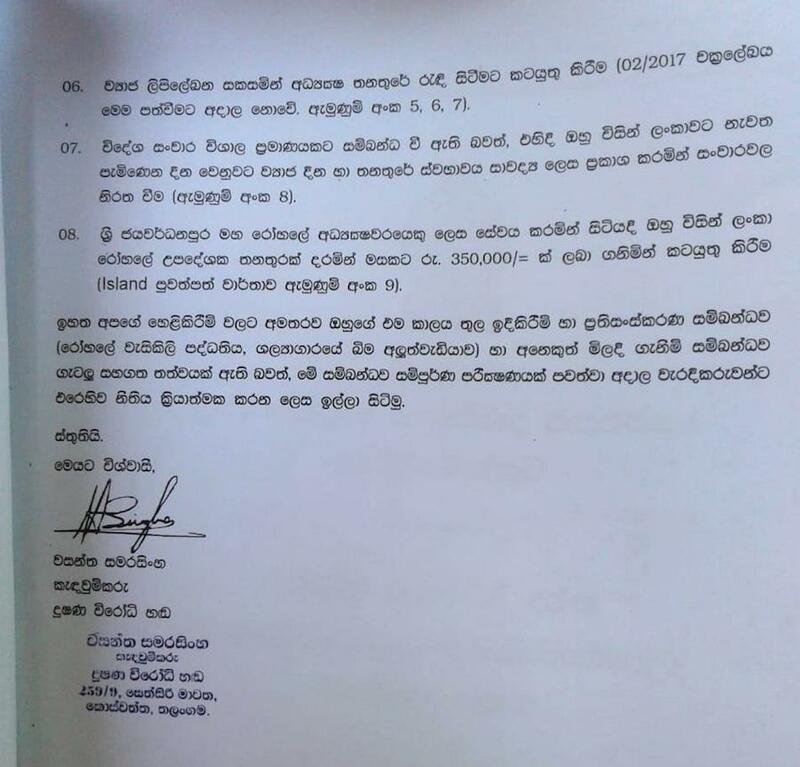 One day after Voice Against Corruption lodging a complaint against the massive scale financial fraud committed by the illegally appointed fake director of Sri Jayewardenepura General Hospital Dr Susitha Senaratne yesterday, he was removed from his fake appointment today via letter, Colombo Telegraph learns reliably. Susitha Senaratne, banned from attending even the Board Meetings of the hospital by the courts due to the illegal nature of his appointment is a political appointee and an accolate of Rajitha Senaratne, Minister of Health. 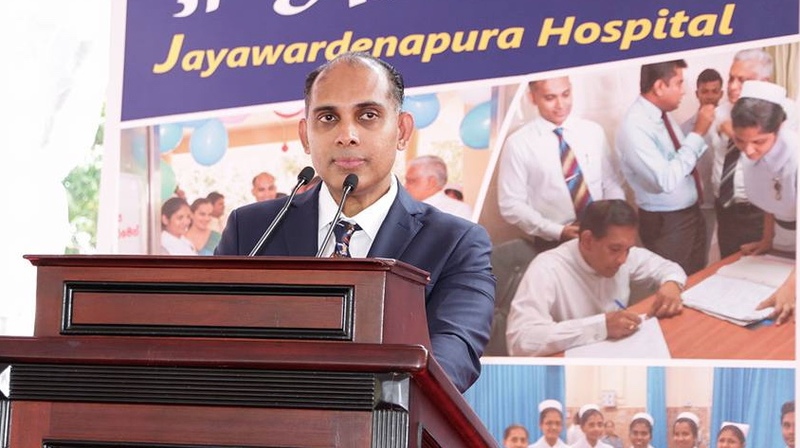 Today, via a letter delivered by Dr Athula Kahandaliyanage, chairman SJGH, Susitha Senaratne, was informed that he is transferred back to Lady Ridgeway Hospital, NHSL where he will go back to being a medical officer. Colombo Telegraph earlier exposed a mega financial fraud where Suistha Senaratne has paid Telichanneling PVT Limited nearly 18 million rupees of public money for a document digitalizing project. This fake company whose address and telephone numbers were also found to be fake, has Susitha Senaratne’s wife Ancy Senaratne as a director. Ancy Senaratne is a medical officer at the OPD of Central Hospital Maradana. For over 4 years, the majority of the specialists of SJGH, vast majority of the nurses and other staff have been battling this corrupt political stooge. Athula Kahandaliyanage amidst mounting pressure to take action following the Government Auditor’s report exposing the massive fraud of document digitalizing project of SJGH finally subjugated to the due administrative stance regarding Susitha Senaratne. 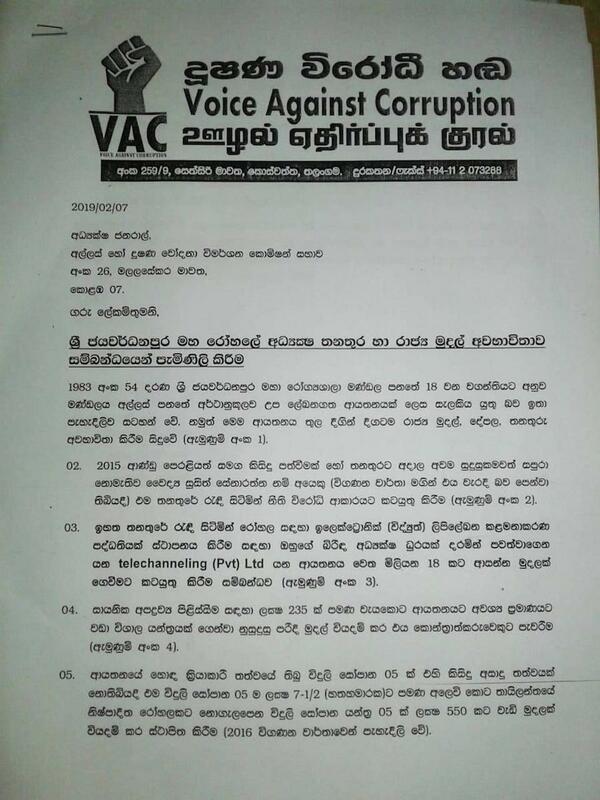 Wasantha Samarasinghe, convener of the Voice Against Corruption has submitted all the relevant evidence pertaining to the massive financial and administrative fraud to the following investigative bodies. 1. Administrative corruption committed by appointing a completely unqualified individual to a tertiary care hospital as director and perpetuating his appointment by illegal means. 2. Massive financial fraud committed by Susitha Senaratne in paying 18 million rupees to a company directored by his wife Ancy Senaratne and all the tender irregularities surrounding this fraud. 6. Submission of false details and dates regarding overseas travel to the Ministry of Health and submitting false data about his professional grade and occupational details. 7. Drawing a salary of Rs 350 000 per month from Lanka Hospitals, another government enterprise “while working full time at SJGH” This submission by the Voice Against Corruption has been accepted by all the investigative bodies to which it was submitted and police and relevant units are alerted about the possible manipulations and theft of documents and their alteration/ destruction that is expected in the days to come. Several specialists under allegations of financial corruption, money laundering, tender irregularities have relented under duress and inducement by Senaratne are still desperately lobbying for Senaratne. Contacted by Colombo Telegraph a specialist stated “we are happy that Athula Kahandaliyanage who was protecting Senaratne for so long finally surrendered to the rule of law. As a senior administrator he knows that these verifiable financial frauds are serious and will stand alone as evidence of Susitha Senaratne’s illegal activities. The honest specialists, nurses and employees were harassed, deprived of the opportunity to serve the patients under the tyranny of this corrupt fake director. The Board members who supported this corrupt man should be ashamed. The ex – fake director’s biggest stooge, the Acting Deputy Director Prabhath Werawatte has been appointed to act as director for the time being. We are waiting for a legitimate director to be appointed following the due process”. A nurse stated “one year ago we, the nurses had the guts to get on the streets against this corrupt man with no qualifications. I’m glad that the majority of the specialists have finally rallied around what is right. Even at this moment the four matrons who are the stooges of this fake director are in his office with a few of his stooges. All we want is for our hospital to serve the patients, it should be a place where we can work in peace”. A medical officer quoting for Colombo Telegraph stated “finally justice has prevailed. We worked under exceptionally corrupt conditions where this fake director induced the SJGH GMOA branch president, secretary and office bearers. I’m sad to say that these GMOA members even went to the Minister to beg him to keep this corrupt man in our hospital. We lost our honor as doctors. I’m happy that majority of our specialists has the moral character to oppose this man. The minor staff and nurses too were great. Now the LRH Radiology department can enjoy their returning MO. We are free of him”. Colombo Telegraph reliably learns that Voice Against Corruption will be making similar submissions about Susitha Senaratne’s network of individuals working closely with suppliers, tenderers and money launderers to carry out these frauds. These include some of the prominent specialists at SJGH, the office staff of the ex-fake director and officers of the administration and financial sections of the hospital. Over to you Mr. President !! Over to you Minister of Health !! All those responsible for this massive fraud should be punished and the money recovered. Enough is Enough. He was appointed with the blessings of the minister of health. So he is the responsible person for this fraud. Don’t worry. Mahinda Rajapaksa was also an illegally and unconstitutional appointed Prime Minster. Did Mahinda steal too? Or, did he do all of that in the past. Mahindra did not steal….he just helped himself….because we had too much Foreign donations coming into the country for rehabilitation programs. What Mahindra did was for Safekeeping, he invested all that money into several bank accounts under several charactets. How lucky his Hijos…Ellos tienen mucho dinero. It appears that the Minister of health insists that there is no Pig fat in the milk powder imported from new Zealand. Can you believe him after the fake appointment and his contribution towards FRAUD? President & Health Minister must take urgent and Urgent Action by getting their act together. It is too obvious the Government Hospitals have run out of drugs due to shortage of funds and putting hapless patients at risk. The Minister who appointed him, would have been aware of his activities, and should explain. The financial frauds should be followed up by auditors who should report to police for action. GMOA should expel those members who helped in the fraud. Some say “URGENT ACTION”. That is “BS” and waste of breadth. In Sri Lanka, simple “Investigations” and “Legal Actions” are very “constructively” manipulated to prolong in bringing the culprits to book. In that process, mainly the PEOPLE who were made to “PAY” , by means of “Indirect Taxes”, even when buying a 1/4 loaf of bread and a cup of tea, for all that money “Robbed” and “Pilfered” by these “VIYATHTHU” – the “INTELLECTUALS”, who AGAIN were afforded by the PEOPLE for educating them, are and would go SILENT. For example, do the PEOPLE , “KNOW” and “CARE” for what is going on in courts and specially the cases that are expected to be taken up and disposed by the “Special Courts” set up to handle such matters termed “Mega Frauds”. Weeks back, when the case against “GR” – fraud involving the construction of a “Monument”in honor of his Late father was taken up, the “Eminent” lawyer raised the objection: “This Court has no jurisdiction” to hear this case”. This same “Objection” was taken in defense of the case against Gamini Senarath- the ex Chief of Staff of MR and in fact he appealed to SC. Now he has “withdrawn” the appeal.. These are “TACTICAL MANIPULATIONS” adopted by the “VIYATHTHU” – the “INTELLECTUALS”, to “DRAG” and “POSTPONE” the issues, so that the PEOPLE will “FORGET” and “LOSE INTEREST”. In another example do PEOPLE , know or bother to find out what happened to many cases of fraud running into “Millions” filed against ex “Monitoring MP” Sajin Vas Gunawardena.?. At the end of the day, if the PEOPLE are “SILENT” and “NOT INTERESTED” in “RECOUPING” their OWN MONEY, robbed and pilfered by these “SMART COOKIES ” appearing as “VIYATHTHU” – the “INTELLECTUALS”, this ROBBERY will continue unabated. The only SOLUTION is the very “OWNERS” of the wealth – the PEOPLE must RISE UP.. Time is ripe and if MISSED, it will be MISSED for ever. “MISSED” means, the other “FACE” of the coin will take over and continuity will be staged. This is the National Malaise. Sinhalese are like thin bamboo. Hollow inside and bend with the wind. The blood is polluted, so for ever it is status quo. Mr. Wasantha Samarasing of “Voice Against Corruption”. I have a proposal for you. Please assemble a “Team of Lawyers” who are ready and willing to provide “Voluntary” services and file a case in an appropriate court, naming : Dr. Kahandaliyanage & the Board of Directors of the Hospital; the Minister in-charge and the Administrative Authorities of the Ministry; this named “Dr. Senaratne & his wife who had a “Non Entity” Business; the Attorney General and relevant others (named by the Team of Lawyers) as “RESPONDENTS” and you & your “VAC” for and on behalf of the PEOPLE as the “COMPLAINANT”. If you need, name a few of the willing TAX PAYER too. If you do need, financial resources, set up a “PUBLIC TRUST FUND” from the contributions from the PEOPLE for which purpose, you can hold meeting and rallies in all the Districts and EXPLAIN your case. The “Initial Deposit”, I am sure, Mr. Tilvin Silva – the Secretary of the JVP, who is due to receive Rs. 10 million(of course minus his Layers Fees) from Mr. Wimal Weerawanse, will gladly “Donate” to the fund. Most importantly, remember to pray to RECOUP the “LOSS” ( by way of pay back or failure to confiscate and sale of personal properties and other assets, because all that are illegally and fraudulently collected) and REMIT such funds to the PEOPLES’ TREASURY. Before I forget, please NAME the “Chairman” of the COPE, MP Mr. Sunil Handunneththi also a “RESPONDENT”, because this COPE also, some time back did an investigation into the affairs of this hospital. This is a grand way to CREATE an AWARENESS and WAKE up the SLEEPING (for being helpless, an innocent) PUBLIC to show their “SUPREMACY’ in all matters of Governance. Thank you Colombo Telegraph for fighting for what is right. Our Matrons have no respect. They were crying at the Director office even today. They don’t have any shame. Finally chairman had the guts to kick him out. It took him 4 years to do the right thing. If you deduct everything that was stolen by Susitha Senaratne , our hospital must be bankrupt. We the doctors, consultants, nurses, orderlies , para medics work round the work for our salary and Suistha Senaratne has stolen the money we have earned for the hospital. The police should arrest him and his wife. Are you joking? Chairman kicked him out not because he was convinced that the guy was stealing but he was told that the guy was trying to undercut him to become the next chairman. This guy hosted a party few weeks ago with suppliers’ funding, to canvas his case to Rajitha through his stooges. This guy is close to Ranil too. Fake land full of fake doctors, fake lawyers, fake presidents, fake prime ministers, fake politicians, fake heroes, fake patriots, fake history and fake claims and fake every thing. Even God cannot salvage us. i checked this matter with the minister. he said, he is the one who removed him, because of te complains against him. ( ther’s no court case or something like that. ) and, there’s no friendship between thusitha and the health minister.,. he is not related to the minister at all. his appoinment was done by the minister , yes you are correct. all the directos, chairmen are all political appointees. it is a common practice in all the other ministries too. not only for the health ministry. actually, those doctors are tge one who helped to brig yahapalanya.during 2015 elections. he has the qualification to be a director at that time. ( you said those were fake documents. we’ ll check that soon. not sure about that. we’ll see). thanks. Do you mean postgraduate degree in medical administration? It seems every mother’s son and some daughters who are put in high positions, turn out to be crooks, and rip off the country. Shame on these scoundrels. Many Sri Lankans are waiting to see one of these scavengers of the nation going in to jail for many years (not in the prison hospital to have a taxpayers paid holiday) . Mr President now you have a solid case with hard evidence to see your action against corruption. I am sure they will use some of their looted money to prove their innocence, pay for another set of scavenging lawyers. We don’t care about your past failures for various reasons. At lease try to start your good governance policy with jailing of everyone involved in this racket. If you cant get involve means that your are protecting someone close to you or you had a indirect cut from this loot. If the big fish can make money through fake projects or projects implemented below standard then why not the sprats like us? That seems to be the attitude of the young Doctor Senaratne. For this purpose his wife too got involved. If my memory serves right, even Dr. Rajitha Senaratne was unseated as MP for doing business with Government along with his wife whilst being an MP. So doing all sorts of business amounting to a serious conflict of interest seems to be the name of the game for quite a long time. The reality of the matter was that young Dr. Senaratne was given an opportunity to make money with the important condition attached, namely, DON’T GET CAUGHT. He violated the condition and so his honeymoon is over. No country is fraud-free. The fraud in our pre-independence era was negligible. We were then conditioned to accept fraud as part of governance. Anyone attempting to investigate were harshly dealt with. We entered an era of hush-hush word of mouth. We then openly pointed out fraud and nothing else. We saw action in the SJGH. Will we ever enter the time-zone when frauds are prosecuted? I agree. One of the reasons for fraud being negligible during our pre-independence and immediately afterwards was the pay packet was enough not only to meet the ends but to save money for the future. Now? We all know the answer. This is why LKY of Singapore was keen to pay the public servants that amount of money so as to keep the country reasonably corrupt free. Because of infirmities in our judicial system, there can be a possibility of entering into a time zone where all the suspected fraudsters (Suspicion is enough, no trial) would be rounded up to face a firing squad, long before we enter the time zone when frauds are prosecuted. Then why did for example the bond scam happen? Was the minister’s pay and other privileges and benefits not enough to maintain his reasonable living. Was the Minister living with his family in a ramshackle? One must not underestimate the importance of acolytes and lackeys! All politicians speak against them when in opposition but when hey come to power what happens they do exactly what their predecessors did, appoint their stooges, acolytes, or lackeys too top posts! So there do see their value in doing their sacred duty! Lets be honest, we are commenting here in this forum with so much anger and bitterness against such appointments. What will anyone of us do had if we were in the position of the Minister? Will you not appoint a known faithful person who will not stand in your way and say yes to everything? What will anyone of us do if we get selected just like the former director of Sri Jayewardenepura General Hospital Dr Susitha Senaratne to such posts when we are NOT qualified, offered a high salary? Will we leave it or take it? Be honest, the answer is we will also do what the Minister did and appoint someone you trust who will work faithfully without any questions asked and not leaking any information that can be harmful to minister! So these acolytes do a valuable job! Long live acolytes, long live lackeys, your services are needed!! That is why the President, Prime Minister and ministers select such people even though criticize them when in opposition! Nobody appreciates your thankless service but will grab the job you do when offered to them! I have come to your rescue!!! Even though news papers portray themselves as non partisan my comments may not get published. Dr. Senaratne was my Intern House Officer in 1992/93 in GH Karapitiya. He was honest, knowledge and hard working. Is the decendant from a good family and is an old Royalist. As per correctness of giving the contract of digitising some hospital paper to a company associated with his wife I am unable to comment but if proper tender procedure was followed and that company bade the lowest there is no irregularity perpetrated. SJGH is being governed by a Board of Management appointed under the SJGH Act No 54 of 1983. Hence the usual rules that are applicable to DHS does not apply to SJGH. I think Dr. Senaratne is senior enough to be appointed to the post of director. I am sure he must have followed the usual procedures in the other transactions. He is a good administrator and is fearless. So he may have angered some around. GMOA was against him too. I wish him good luck in proving himself innocent. We trust you with or without the alphabets before and following your name. Will you be kind enough to perform a walk-through test and let us have a report. “”A walk-through test is a procedure used during an audit of an entity’s accounting system to gauge its reliability. A walk-through test traces a transaction step-by-step through the accounting system from its inception to the final disposition. A walk-through test is only one of many tests performed by auditors during their evaluation of an organization’s accounting controls and risk management measures. The test can reveal system deficiencies and material weaknesses that would need to be rectified by the organization as soon as possible.